Ucluelet is a growing summer vacation spot and yet, some will tell you that winter there is the best time to go. Why would anyone go to one of the rainiest locations on Vancouver Island in the middle of the rainy season? As it turns out, there are plenty of reasons. Find ten of them below. They might just convince you to spend your next winter vacation in Ucluelet, B.C.! Visitors are blown away by the magnificence of west coast storms during the winter. Monster waves, given their power by gale force winds, smash against the coastline of Ucluelet in an exhilarating show. Geared up in head-to-toe waterproofing, heading to any beach near rocky outcrops, or perhaps the Wild Pacific Trail. You’re definitely in for a show! Just don’t get too close to the water, or you could be quite literally swept off your feet. Rather than breaking the bank for a luxurious suite in the summer, visitors to the West Coast are beginning to discover that the same suites are nearly half price in the offseason. 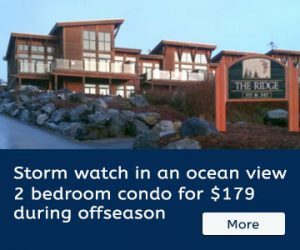 If you’ve ever been discouraged by your budget vs. accommodation in Ucluelet or Tofino, winter is the time to come. Winter storms are that much sweeter next to a fireplace and a picture window. Until the rest of the world catches on, winter on the coast means a quieter, cozier town. It’s a time to kick out the summer crowd and relax with the winter warriors. Expect shorter shop hours, but also shorter line ups. Imagine getting in first try at the best brunch spot in town. Now THAT is something worth experiencing. Speaking of winter warriors, the locals are likely the happiest of the bunch that it’s winter. Ucluelet is finally theirs again. That means you’re not going to be meeting hordes of other tourists during your visit – you’ll be meeting the characters that make Ucluelet what it is. Nothing lets you experience a destination quite like knowing the locals. While the summer surf is nice for learning, the winter waves produce bigger swell with a bit more punch. That means surfing isn’t just a top thing to do in the summer, but for seasoned surfers (such as the locals here), winter is the best time to get out and play in the Pacific Ocean. Winter wetsuits are a must, and like the storm watching, seeing the surfers enjoy the swell can make for a fun afternoon. That is, if you aren’t keen on joining them in the water yourself. Winter in Ucluelet puts the “rain” in rainforest. However, there’s nothing quite like being amongst the trees during the winter season on the west coast of Vancouver Island. Many of the hiking trails remain dry enough to enjoy, sheltered by the towering Douglas firs, cedars and spruces. In particular, the Wild Pacific Trail remains a top thing to do all throughout the winter, and offers spectacular views of the storms, too. Speaking of hiking in the rain, rain gear fashion is another must for winter in Ucluelet. Head to toe waterproofing is the epitome of style. High gumboots, coverall rain pants and long rain slickers with neoprene cuffs make even the most seasoned locals jealous. Umbrellas are laughable – the wind won’t allow it – but if you’ve got a good hood and cozy layers underneath your waterproofing you’re pretty much set. That being said, there can be cute rain-proof outfits, but even if you look like a garbage bag caught in the wind, you’ll fit right in for the winter in Ucluelet. While the rain is soothing and a blast to endure outside, there’s another charm to rainy weather. You never feel like you HAVE to be outside. There’s just as much bliss lying in bed listening to the sound of the rain as there is dancing in it with gumboots on. When it’s really coming down, absolutely no one will suggest a walk, hike or beach day that you feel obligated to go to. Nope, you can sit on that couch all day guilt-free. ‘Tis the season for the best wood (or gas) fires of the year. Put on the kettle or the coffee, grab the baileys (or milk) and melt next to your live version of the Yule Log Channel. Most accommodation has at least some type of fireplace to create that wonderful, cozy vibe. In town, the charming scent of wood smoke takes to the skies as locals dig into their stockpile of wood for the winter. There’s nothing quite like the warmth of a wood fire in the winter to get the chill and dampness out of your bones. Finally, just before winter becomes spring again, the towns shake off their hibernation for a celebration – the gray whale migration. From February to April, nearly 20,000 gray whales pass by the west coast of Vancouver Island. That means that whale watching, a top thing to do in Ucluelet, reaches a fantastic peak during the winter. Not only is the whale watching good, but both Tofino and Ucluelet celebrate with the Pacific Rim Whale Festival. Fun activities bring the locals together, and visitors have the chance to learn about whales, the West coast, and learn from keynote speakers about things like First Nations culture and other wildlife. Not to mention there’s the Chowder Chow-down where restaurants compete for the best Clam Chowder recipe by vote. Come hungry. For a head start on finding luxury accommodation for a good rate in Ucluelet, check out www.vancouverislandvr.com. They have stunning ocean view condos that will make you feel right at home. Plus, there are fireplaces.